As youngsters most of us attach ourselves to heroes, idols, role models, and other grown-ups who do things which are far more interesting than the things our parents do. As a young lad back in the 1980’s and 90’s I took the unassuming and diminutive England football international Peter Beardsley as my role model; as you can tell, I was not a boy who was seduced by any element of glamour in the beautiful game. Thankfully neither did I try and emulate Beardsley’s famous crooked chin and pudding basin haircut. In those impressionable years we watch and read about sportspeople, musicians, and actors, and we believe the hype. If, for example, someone is flippantly described as a genius, we believe that they are actually a genius and have access to a mysterious and otherworldly gift. As we get older most of us realise that these people are simply extremely good at one very specific task that, luckily for them, generates a tidy income and the adulation of millions. Some people get older and never realise this, and become increasingly bitter at the ever widening gap between their “hero’s” life and theirs, and the ever more expensive Sky Sports package required to facilitate that. But even those of us who have successfully grown out of hero worship are, from time to time, sucked in by those moments when we feel that bit closer to those glossy superstars that we might once have idolised. 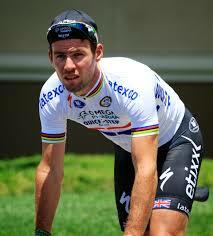 Take top British cyclist Mark Cavendish and his recent crash in the Tour of Britain. Whilst flying along some non-descript B-road in the north of England Cavendish unfortunately managed to clip a parked car, and suffer a nasty crash which left him prone in the road and out of the race. It looked like no laughing matter. The fact is, I too know the pain and embarrassment caused by a coming together with a parked car. Admittedly, my little incident didn’t take place on national TV whilst I was busy jostling for position in amongst a hundred or so of the sport’s top bike riders. My crash was caused by an ill-advised solo sprint down a rural high street towards a cappuccino in my favourite café, and my audience consisted of nothing more than a few bemused passers-by. As I stamped powerfully (!) on my pedals my aged bike chain managed to slip a couple of teeth on the front chain-ring, causing me to launch forward chest first across my handlebars and assume an unintentional Graeme Obree riding position. 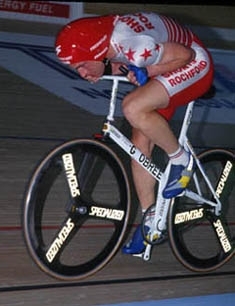 My brief test-ride in the Obree position confirmed that not only do I not possess the Scotsman’s physical prowess, my bike handling skills are in need of work too. As my bike swerved beneath me I collided hard with a parked Range Rover. As I sat confused in the middle of the road, front wheel buckled beyond repair and warm winter kit torn from groin to knee, the similarities between myself and one of Britain’s top sportsmen – Cavendish – were not at the forefront of my mind. This was not my finest hour. Far be it from me to criticise Mark Cavendish’s ability to ride a bike, but I suspect he will be happy to forget his little tumble too. But there we go: most of us grow up and grow out of hero worship but sometimes, when we’re least expecting it, we find ourselves (however briefly) on a level playing field with them after all. The fact that for me and Mark Cavendish the playing field consisted of a patch of rough, damp tarmac in northern England is neither here nor there. Geez, man… Hate to chuckle at a brother’s misfortune, but C’mon man! I know, I know. I was a shambles that day! The only way to look at heroes is from a slight angle.